Bell Peppers are so fun! They're just like little natural flavorful, attractive, beautiful bell shaped containers and decorations that you can eat! What more do you want in a veggie - except guess what, it's not a veggie, it's a fruit! Surprise! 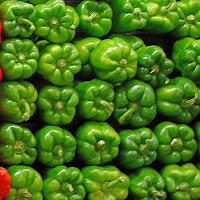 In spite of the word "pepper" in their name they are not spicy, but are rather are tangy and sweet with green peppers being the less sweet variety. Depending upon their color they are high in vitamin C and A. You can eat bell peppers cooked or raw. Dried bell peppers are the main ingredient in paprika; a mainstay in Creole, Mexican, and many dishes we have come to know and love. You can bake them, grill them, dice them and add them to almost any dish be it savory or a salad. They come in the most wonderful colors of red, yellow, green, orange, even purple, white and rainbow. 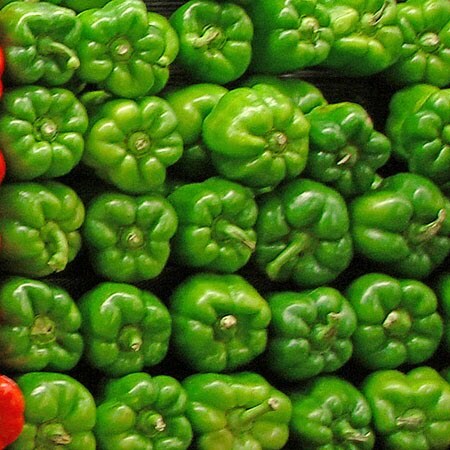 Buy the bell shaped peppers not for taste, because the shape doesn't matter, but for ease of cutting and to avoid waste. To cut and deseed a bell pepper you will need a sharp paring knife, first cut off the top of the bell pepper below the stem, then look inside and you will see that the seeds are attached to the inside of the bell pepper by thin flesh, snip this flesh with the tip of your sharp knife, then all you need to do is using your fingers, pull out the white seeds. Then Rinse. That's it! To keep your peppers longer, store unwashed bell peppers in the vegetable compartment of your fridge where they should keep for a week. To freeze: wash and core, then chop them in various sizes depending upon your recipes and how you will use them. Spread in a single layer on a cookie sheet for an hour or longer. Once frozen, put into individual freezer bags (mark and date!). You will be able to use only the amount you desire if you measure out some frozen peppers, then pop the bag right back into the freezer. You can also freeze peppers whole. Crumble about 1/4 cup feta cheese over top before serving. Put salad ingredients in a large bowl and chill. Mix all dressing ingredients in food processor or a whisk until emulsified. Toss dressing with salad. Allow to marinate in the fridge for one hour before serving. Try using sesame oil and rice vinegar instead of the olive oil and balsamic vinegar for a nice Asian flair. I am a nutrition teacher and I always love the unit on fruits and veggies and explaining to the kids how a bell pepper is a "fruit" veggie. Actually eggplant, cucumbers, and anything that has seeds in it would fall into that category!